Established for over 90 years, Jewel Blade Limited is a world leader in the production of high performance precision blades for use in various industries. The UK manufacturer is located in Sheffield, England at the heart of the GREAT British steel industry and is justifiably proud of its long history and unique cutting edge manufacturing facilities. Jewel Blade's expertise, coupled with flexibility throughout the production process and in-house technical support, enables the company to produce blades to customer specifications both quickly and efficiently, thus meeting the challenges of evolving markets. Jewel Blade today boasts an extensive range of commonly used and custom made blades for use in various industrial applications including food processing, flooring, the automotive industry, DIY, roofing, glass and hardware. The strengths of this unique company were enhanced in 2003, when it was acquired by the W R Swann & Co Ltd group of companies, which includes the world-leading surgical blade manufacturer Swann-Morton Limited. 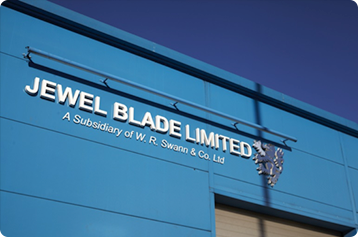 On-going investment in research, product development and technology, combined with a high level of customer service backed up by an extensive network of overseas distributors, has ensured that Jewel Blade continues to grow and develop as a company exporting to over 52 countries worldwide and manufacturing approximately 130 million GREAT British blades per year. The consistent high quality workmanship, durability and performance of their blades is ensured by our strict adherence to ISO 9001 policies and procedures. This, along with the 'Made in Sheffield' mark of quality, give customers confidence in the knowledge that Jewel Blade's aim and focus is to develop successful long-term business partnerships.